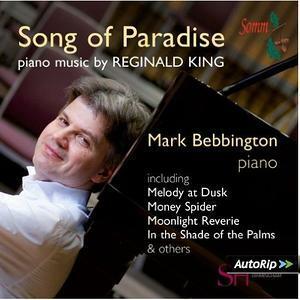 Mark Bebbington performs a disc of piano music on the SOMM label by the neglected lyricist and 'king' of light music, Reginald King. This will be the first commercial recording of these works. Mark Bebbington was instantly won over by the easy-going charm, beautiful craftsmanship and melodic freshness of these 'light' piano pieces. Not for a moment did he feel that tackling this repertoire would feel at odds with the grittier world of other areas of British music he had championed on SOMM. Reginald King (1904-1991) was considered a 'king' of Light Music during his lifetime, but his classical training at the Royal Academy of Music sets him apart and his music is suffused with a lyrical warmth and classical restraint that give it a really "haute couture" feel. He was a soloist with Henry Wood at the Proms, but his greatest successes were between 1929 and 1964 when he gave over 1500 BBC broadcasts with the Reginald King (RK) Orchestra. Bebbington's CD includes 'Song of Paradise' which was King's signature tune and its mixture of warmth, nostalgia, romanticism and sheer escapism best sums up the piano oeuvre of this minor 'great' composer. It also includes 'Melody at Dusk', inspired by a pupil at the Royal Academy who later became his wife. Other works include 'Summer Breezes' and 'Passing Clouds' (both written when on honeymoon) and the mysterious 'The Silent Pool'.